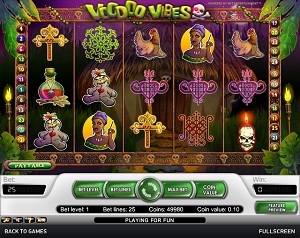 Voodoo Vibes is a mysterious online video slot game from Net Entertainment that has been released in August 2007. This online video slot machine game has 5 reels and 25 pay lines. The theme of Voodoo Vibes, is as its name suggests, the mysterious and frightening dark art that is voodoo. The symbols used in the slot game resemble the characters and other objects in the 2009 Disney movie “The Princess and the Frog”. In case you did not know the story, it is set in 1920s New Orleans, Louisiana, where an industrious waitress named Tiana is dreaming of owning her very own restaurant someday. Unfortunately, Tiana became a frog after kissing a prince who had been turned into a frog by an evil witch doctor that practiced voodoo, and they must somehow find a way to turn back into their human forms before the hex becomes permanent. If you already watched the story and liked it, then for sure you will like playing its slot game version as well! Many online slot players would love to play for free first whenever they encounter a new online slot game so that they can find out if they like that game enough to spend real money in it. Therefore, whenever they see that a particular slot game is powered by Net Entertainment, they are certain that they can instantly play that game, without the need to download anything! As ominous and dangerous as it may seem, the Voodoo Vibes online video slot is an absolute joy to play at, especially for those who have a fascination or are just plain curious about everything that is voodoo. Voodoo Vibes features free spins, scatter wins, a wild substitute, a maximum jackpot win of $15,000, a maximum coin jackpot of 30,000, and an awesome bonus game that makes you practice the dark art on a set of voodoo dolls! Net Entertainment is famous for its quality graphics and realistic sound effects when it comes to their wide array of online video slot machine games. In Voodoo Vibes, they have really done a very good job of incorporating a video slot game together with a mystical voodoo theme. The background setting of the reels is that of a voodoo practitioner’s hut. The symbols are drawn in a very detailed manner and even if most of the drawings are in a dark color, you will still play for a long time as it does not strain your eyes. The characters they used have animated programming once you have hit them. The overall graphic design of Voodoo Vibes shows many different colors such as blue, green, brown, purple, and of course, what’s a voodoo-inspired game without the colors black and red? A continuous faint drumming, the singing of crickets and rustling sound made by wild animals is the constant background sound you will hear while playing the Voodoo Vibes online slot game. When you spin the reels, you will hear many kinds of creepy background sound effects that are so common with voodoo-related movies once you hit a winning combination. When you happen to hit a winning combination with the Wild symbol, a man’s deep, throaty laugh will be heard. As for the Scatter symbol, you will hear the snake hissing and rattling when you hit a winning combination with it. There are no card deck symbols available in the Voodoo Vibes online video slot game. The regular symbols that you will find in Voodoo Vibes are the Skull, the Voodoo Woman, the Rooster, Potion, and peculiar symbols such as Vever, Cross, Protection and Voodoo Charm. The Wild Symbol is the Voodoo Man. The Voodoo Man acts as a substitute for all other symbols (except the Scatter symbol or the Voodoo Doll Bonus symbol) in order to help you complete a winning combination. In Voodoo Vibes, there are 2 Scatter Symbols – the Snake and the Voodoo Doll Bonus scatter symbols. Scatter symbols mean that they do not need to appear in a line (on an enabled pay line) for you to win. • The Snake scatter symbol can be scattered anywhere on the 5 reels for you to complete winning combinations, as long as there are 2 or more Snake scatter symbols that appear. Your winnings are calculated by multiplying the Snake scatter symbol combination payout (shown in the Paytable) by the total number of coins you’ve bet. If you hit 3 or more Snake scatter symbols, you will activate the Free Spin Bonus Feature game. • The Voodoo Doll Bonus scatter symbol can be scattered anywhere on the reels, as long as you get 3 or more of these scatter symbols to appear in consecutive order. If you hit 3 or more Voodoo Doll Bonus scatter symbols, you will activate the Voodoo Doll Bonus Feature game. Do take note that if you get a scatter win and a regular win, you are paid out accordingly for both of those wins, because the Snake scatter symbol is not required to come out on an active pay line for you to win. The scatter wins are added to the pay line wins. The first Bonus Feature game is the standard one, the Free Spin Bonus Feature Game – it is triggered when you hit 3 or more Scatter Symbols (Snake) and you are rewarded 10 Free Spins wherein all the winning combinations that you hit during the Free Spin games are tripled! Please take note that the Free Spin Bonus Feature game can be re-triggered even while you are playing your current Free Spins. When the Free Spin Bonus game is over, you are then taken back to the regular Voodoo Vibes slot game, and all of your Free Spin game wins are added to your total win. The second one is the Voodoo Doll Bonus Feature game. It is triggered when you get 3 or more Voodoo Doll Bonus scatter symbols on one or more pay lines. These Voodoo Doll Bonus scatter symbols are scattered anywhere on the reels. Once activated, you will be then taken to a place where there is a shelf with 12 voodoo dolls. Stick the pin and win random bonus prizes hidden within these voodoo dolls. The Voodoo Doll Bonus Feature game ends when you pin on a voodoo doll and it gives out no bonus prize. When it comes to voodoo, most people would think that sticking pins to dolls would mean you are hurting others, but with this slot game, you will surely love sticking pins to those dolls as they are the only ones that can give out extra bonus prizes! Voodoo Vibes has 5 reels where you may bet on as many as 25 pay lines. The minimum bet is 0.01 and the maximum bet is 0.50 per pay line. You may wager from 1 up to 4 coins per line. People who frequently play online casino games typically love to stay longer on online slot games that have an Autoplay function. Good thing that Voodoo Vibes is equipped with one! You can have the game spin automatically for you with the Autoplay function that can be found on the lower left side of their game screen. With the simple setting, just choose a button (from 10 to 1000) which means that those are the total number of spins that will be done automatically for you. With the advanced settings, you can choose to Stop Autoplay on any of the following conditions: on any win, if Free Spins is won, if the bonus game is won, if a single wins exceeds a certain amount you indicate, or if your cash increases or decreases by a certain amount you indicate. After putting in your preferences, just click on the Start button, and the game will automatically spin for you while you just sit back and enjoy playing this supernatural and magic-filled online video slot game!